1. Use the correct containers to submit samples. Please use only the tubes and plates below. We have them available for purchase at the Core facility. Every tube must be labeled with Tough-Tags. 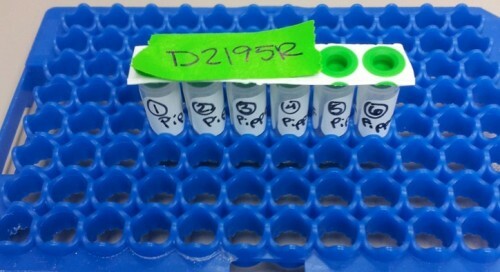 Clearly label the tubes numerically (1, 2, 3, etc.) followed by the sample name. Add a piece of tape with the order ID on top of the tubes! The tubes must be ones purchased from us (see picture below) as they are used with our laboratory robotics to process the samples. Starting with A1, fill the plate by column A1, B1, C1,…H1, A2, B2, and so forth. Cover the plate with sealing film. 2. Add the right amount of DNA, primer to tubes or plates according to the table below. Please do not submit less than 10 ul total volume. Primer must be added by the user. **Important Note: The facility provides the following Common Primers: M13F, M13R, SP6, T7, T7Terminal, and T3. See Primer Sequences. It is the user’s responsibility to add the primer to his/her samples. 3. You will receive an email from our system when the sequences are ready for download. All DNA should be checked for concentration and purity before submission to the Core, both by OD as well as agarose gel. We will not reprocess samples for free that have obvious problems with concentration and/or purity. We recommend DNA templates, both PCR and plasmids, to be purified using prep kits from well established brands such as Qiagen, Invitrogen, Millipore, etc. Excessive salt, alcohol, protein and RNA will compromise the sequencing reaction. Left over primer and dNTPs from PCR reactions will also interfere with DNA sequencing. Log in to the Resource system to submit your order. Click here to login. Drop off your samples at one of the assigned locations. Off-campus users please FedEx your samples to our lab. Samples should be fine shipped at room temperature.